This sliding glass patio door has been designed to meet critical specifications for use in large sizes and where high structural ratings are a necessity. 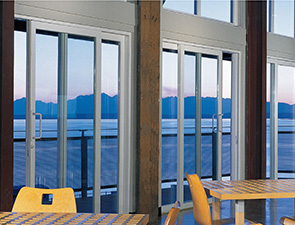 The high-strength Showcase sliding glass patio door is available with hurricane IMPACT ratings. The vinyl extrusions for Earthwise Series doors feature aluminum (standard) or steel reinforcement. This heavy-duty construction assures the strength and stability needed in high-load applications. The Earthwise Series sliding patio door is available in 2, 3, and 4-panel configurations that reach up to 16 feet wide and 10 feet high. Custom, Legacy Style Handle (zinc with powder coat), and heavy-duty, corrosion-resistant lock (keyed from outside) is standard with Earthwise series doors. A stainless steel track and full stainless wheel and carriage construction ensure long-term ease of use. The Earthwise Series sliding glass door is manufactured with long-lasting vinyl extrusions that will stand up to any climate conditions. It will never pit, warp, rot, corrode, peel, or crack. You’ll find the professionals at Showcase Custom Vinyl Windows and Doors are expert at building products for the Gulf Coast. All of our products carry a Limited Lifetime Manufacturer’s Warranty plus the Good Housekeeping Seal two-year money-back guarantee. Add this to our exceptional customer service, and you have the best multi-panel doors available for the region. Available with Traditions® SDL or GIA. Sill colors match frames, including 2-tone. Lifetime Limited Manufacturer’s Warranty on patio door; 10-year warranty on laminate finishes.